It seems everyone is looking for that one great party snack. That perfect hors d’oeuvres that achieves the impossible. It has to be tasty – a real crowd pleaser. It must look impressive; some might say kind of fancy. Oh, and it has to be easy. The ability to make-ahead would be nice too. As the requirements grow, the list of possible options shrink. I get it – high dazzle, minimum effort. Story of my life. Recently, a student of mine asked for this very thing. As I tossed out one idea after another, each was rejected for a minor technicality. Too messy, needs a plate and fork, too involved, no pork (no! ), too large, etc., etc. 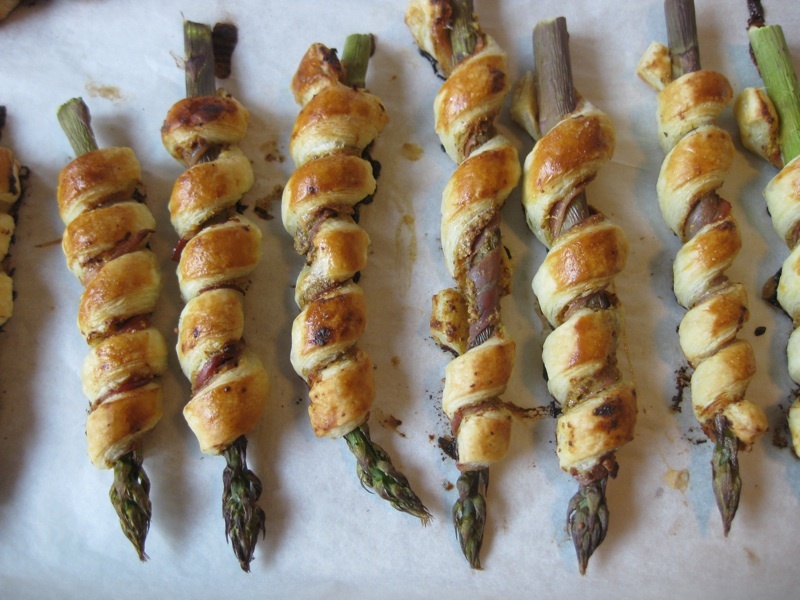 I racked my mental storehouse of recipes and suddenly remembered a simple one that wound puff pastry strips around fat spears of asparagus. Work in some mustard for a little zing and a bit of prosciutto (yes!) and you have the makings of a great party. We make these often at a catering company I work for and every time I wonder why I don’t whip these up more often myself. They are beyond tasty and are extremely easy to put together. Sometimes, when I’m really motivated to make them extra special, I make my own puff pastry. It’s not terribly difficult but takes time – I’ll show you how one of these days – and the results are far superior. However, when pressed for time, picking up a box of Pepperidge Farm puff pastry is fine and you’ll have two dozen of these things in a jiffy. 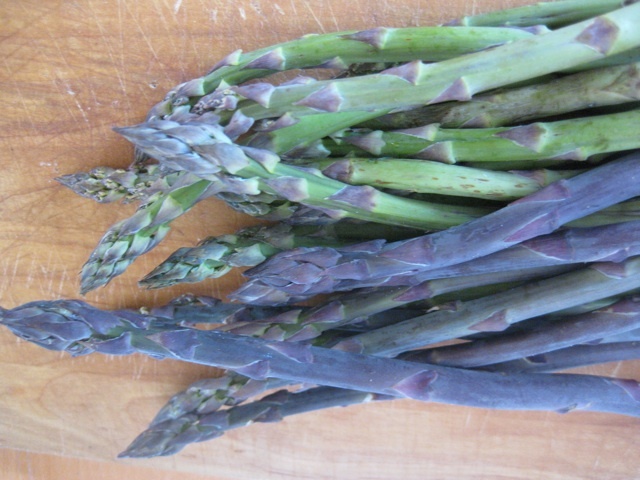 A quick note on asparagus – buy the freshest you can find, local if at all possible. And get the fat stems over the thin– you need something a little more substantial to support the pastry and they hold up better in the oven. I purchased fat green and purple stems from a local farmer, which are just lovely when raw but look pretty much the same once cooked. And you know the trick for trimming asparagus, right? Just bend the end of the stem – it will naturally snap where the fibrous bits end. STRESS BAKING THERAPY FACTOR: MAKE THESE NOW. Dazzling I tell you. A tray of these, all crispy and warm, will be snatched up by a most appreciative audience. No need to tell them how easy they are to put together. 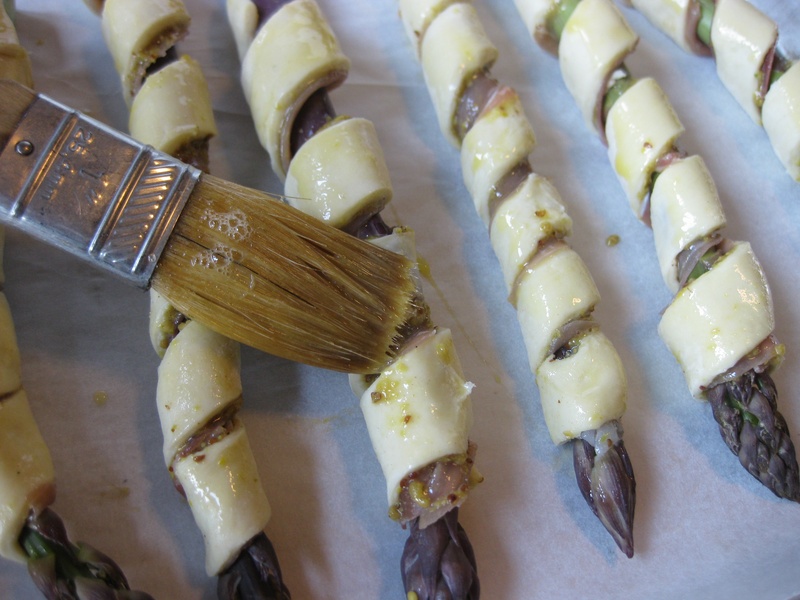 Sure, twirling a mustard-coated dough strip around a slippery asparagus spear can be a bit messy but the end result is worth a smidge of inconvenience. I say go for it. 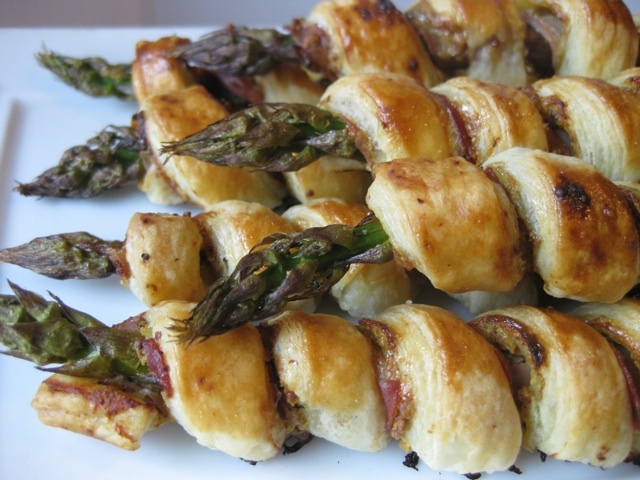 Be sure you make a batch of these before the asparagus disappears completely – around here, I’d say that’s about another week. Get to it. Preheat oven to 425°F and line two sheet pans with parchment paper or Silpat mats. Unfold the thawed puff pastry and lightly roll to even out the creases – make sure to keep it as square as possible. 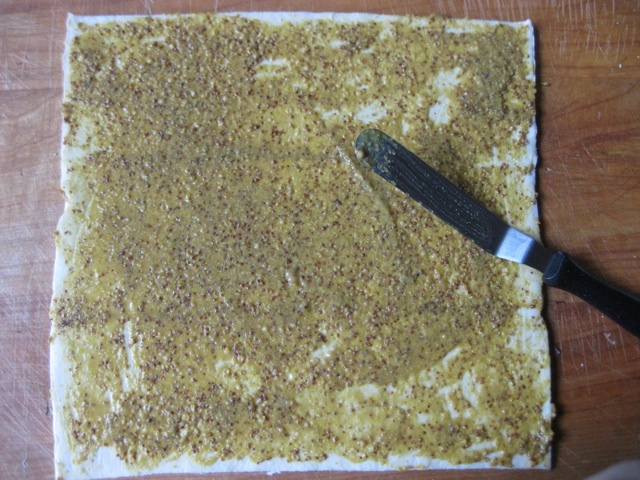 Brush the pastry evenly, right to the edges, with the mustard. Lay the prosciutto on top of the mustard-pastry in an even single layer, to the edges. It’s more important that you have complete prosciutto coverage from right to left so each piece gets some a little. If there’s a gap at the top of bottom, that’s ok.
With a long, sharp knife cut the pastry into ½” long strips – you should get 12-13 out of each piece of pastry. When cutting make sure you cut straight down and through the prosciutto – do not drag the knife. 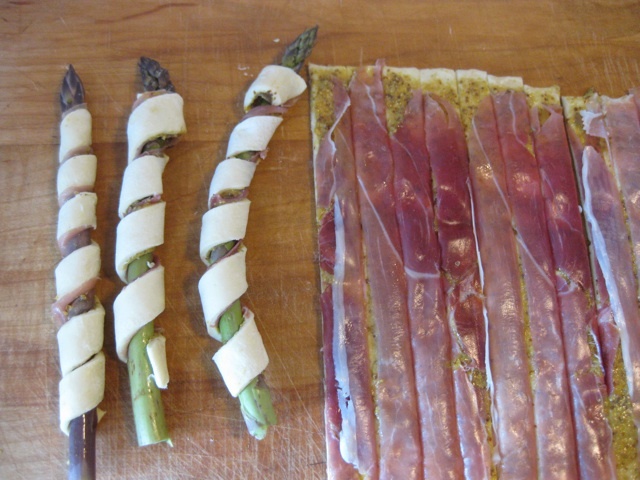 Wrap a strip of pastry, prosciutto side in, around each piece of asparagus in a spiral manner. Place the wrapped spears on the prepared sheet pans, about 1/2″ apart, and brush pastry lightly with the beaten egg. Bake 15-20 minutes until golden brown, rotating the pans halfway through. Let cool until easy to handle, then serve. Can be eaten warm or at room temperature but these don’t hold very well. Make ahead: Best bet is to assemble and refrigerate, tightly wrapped, for up to 1 day then bake right from the refrigerator.